AWS Application Discovery Service (AWS ADS) is a tool that helps an enterprise plan application migrations to the Amazon Web Services public cloud. AWS ADS collects data from an enterprise's on-premises data center infrastructure to provide insight into server dependencies, hardware configurations, usage patterns and more. ADS records inbound and outbound server traffic, and captures information related to the use of resources such as memory and CPUs. The service then stores that data, and enables a user to export it to Microsoft Excel or another tool for analysis. An enterprise can use the data, for example, to perform a total cost of ownership review and estimate how much it would cost to migrate and run their workloads on the AWS public cloud. It also enables an enterprise to group or tag its servers by the applications or workloads those servers support. Via integration with the AWS Migration Hub, the service can also help track the progress of applications as they migrate. An ADS user must have an AWS account and create an Identity and Access Management (IAM) user to assign proper policies and initiate the deployment. An IT professional can access AWS ADS and enable data collection through the AWS Management Console, the AWS Discovery software development kit or the AWS Command Line Interface. AWS ADS can simulate actions and processes with one of two computational models: agent-based or agentless discovery. 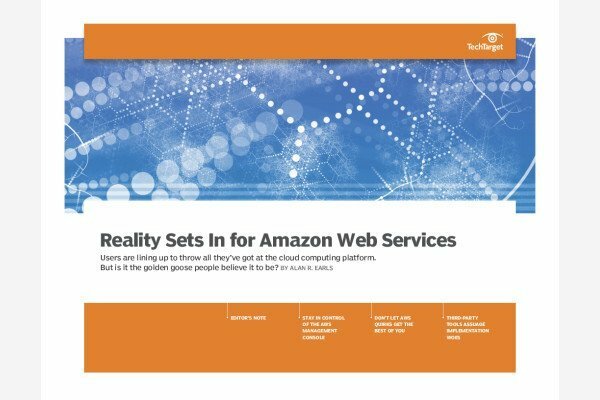 The agentless model enables an organization to gather data about its infrastructure without having to install Amazon software -- called the AWS Application Discovery agent -- onto its host servers or virtual machines (VMs). The agentless model, which Amazon recommends for enterprises that use VMware vCenter Server, can also collect data regardless of the server operating system in use. Agentless discovery collects configuration data, such as IP addresses, CPU allocation and network throughput, but is limited to 10 GB of data per day. To use agentless discovery, an IT professional must deploy and configure the AWS Agentless Discovery Connector virtual appliance. Agent-based discovery requires a user to install the AWS Application Discovery agent onto its host servers or VMs, but collects a higher level of data, such as data related to network connections, compared to the agentless models. Amazon encrypts the data that its agents collect an Application Discovery Service data store. Agent-based discovery limits a user to 1,000 active hosts, 10,000 inactive hosts, 10 GB of data per day and 90 days of data storage. Agent-based discovery works in VMware and non-virtualized environments. Users can also choose to run both the agent-based and agentless modes simultaneously on their infrastructure. What application migration concerns do you have?